Oh dear, I thought, there’s a grammatical mistake in the very first sentence: the preposition “like” used as a conjunctive before a verb, an infelicity repeated numerous times throughout the book. And then there are all these anachronisms, such as the claim that Isis could cure “tuberculosis” (p. 5), a word she certainly would not have known, or the fact that Isis conjured up a “hologram” (p. 116), a technology not invented before the last century. Writing about the ancient past for a modern audience must be a constant juggling act for authors, as they struggle with making their narrative accessible to as many readers as possible while keeping the mood old fashioned enough to reflect whichever time period in which their story is set. Hollywood has long used British or foreign accents to set that kind of mood, but it is much more difficult in writing. Once the readers have accepted the fact that the author has reached out to a 21st century audience, they may not mind such statements as “Cut him some slack” (p. 9), or “I’m a bit creeped out” (p. 65) from characters who are supposed to have lived thousands of years ago in ancient Egypt. Or that Isis is served a plate of “fish jerky” (p. 53), a mid-19th century term that comes from a Spanish word, or again that, upon being crowned as queen, Isis felt “like (sic) I’d won the lottery” (p. 14), the latter a mid-16th century word that possibly has Dutch origins. As an editor, I would have queried the anachronisms, but perhaps the author would have talked me into accepting them for the sake of her story. Fair enough. However, I would have insisted on changing all those uses of “like” before the verb (for the teachers out there, the correct usage is “like” before a noun or a pronoun, but “as” before a verb), as well as one small adjective that gives a nuance that was perhaps not intended. At one point, the author describes the well-known and magnificent Queen Cleopatra — she of Theda Bara, Claudette Colbert, and Elizabeth Taylor fame — as “the infamous Cleopatra VII” (p. 126). The adjective “infamous” has a fairly negative connotation and we should be careful to not color people’s attitude by using it indiscriminately. Remembering that history is usually written by the winners, Cleopatra had the misfortune of backing two losing horses, Julius Caesar and Mark Antony, and subsequent historians were not kind to her memory. To put it mildly, she got pretty bad press! That said, readers may be amused to find out that when a young Horus says “isn’t that cool?” to his mother Isis (p. 82), he’s using a term (the verb qeb) often used by ancient Egyptians to express that all was well. Pretty cool indeed. The story follows the ancient myth as told episodically by various ancient Egyptian texts and by Plutarch, a first-century AD Greek writer who collected these various strands into a more continual narrative. Osiris and Isis were originally a royal couple who were much beloved by the population. Osiris’s brother Seth was jealous and devised a way to kill Osiris and get rid of the body. After a long and arduous search, Isis and her sister Nephthys manage to find Osiris and Isis revives him long enough to conceive a son, the falcon-god Horus. Here, the author is a little coy where Pharaonic images are pretty straightforward. Isis simply has a vision of a baby seated in her lap and later on she rests her hands on her belly after being told by Thoth, the messenger god, that she needs to “raise that baby of yours” (p. 41). 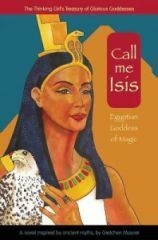 But Seth is still dangerous so Isis must escape to Khemmis, a city in the Egyptian Delta, where she raises her son on her own, all the while using her magical skills to protect him from all manners of hazards. When Horus has grown, Isis and Nephthys take a harrowing trip through the Underworld to meet Osiris, who has become ruler there. Here the author demonstrates her mastery of the ancient Egyptian world. She has clearly done her homework, as she correctly identifies various denizens of the netherworld, along with their proper names and functions. Those sequences are wonderfully evocative. In the end, and after more adventures, Isis magically produces the previously mentioned three-dimensional image of Osiris to an astonished divine court. The scene serves as a deus ex machina that solves everything, as Osiris tells his version of Seth’s fratricide and duplicity. The expected happy ending then tells of Horus claiming his father’s throne alongside his exultant mother. At this point, the author pulls off her biggest trick, but I don’t wish to give it away and spoil the fun. Suffice it to say that the unexpected ending goes a long way to explaining the anachronisms mentioned earlier. The book ends with a number of appendixes, where we learn some of the original mythological stories about Osiris, Isis, and Horus, along with a few remarks on what the ancient Egyptians wore and ate, as well as the role of women in society. The author then cleverly gives us a multi-page chart in three columns, describing first the ancient myths; then established historical facts that dovetail into the mythical narrative; followed by the fictional part of her tale, where she embellished on the original story line. I found this part most effective and I would like to think young readers interested in ancient Egypt will learn much from a careful reading of this section. This is followed by a useful bibliography, which demonstrates the author’s diligence in collecting her material. From my first somewhat critical reaction to a slight bemusement at some of the twists and turns of the story and how it was told, I felt myself carried along by what, in the end, is a good solid yarn.